Most MLB baseball card collectors are likely familiar with the Topps Signature Series format and 2019 Topps Archives Signature Series Active Player Edition Baseball continues the buyback autograph release for another season. Like every previous edition, each box comes with one buyback card that is signed, stamped and numbered, and then, finally, sealed in a plastic case. As the name indicates, the 2019 Topps Archives Signature Series Active checklist sticks with only current MLB players. However, the buyback aspect means that nearly every Topps or Bowman set from the last decade or so is in play. In case this concept is still unclear, Topps reacquires cards they originally issued. 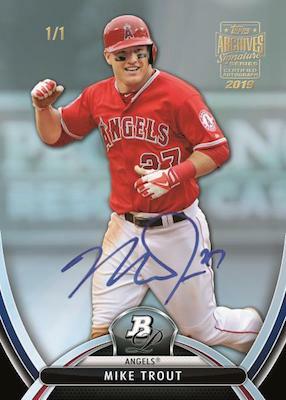 Then, they have the players hand-sign each card that is foil-stamped with the official 2019 Topps Archives Signature Series logo and serial numbered. Every card is also encased. While none of the individual print runs are generally very large, most players have multiple card options and several different print runs. Although Topps has never disclosed the complete print runs, the final lineup of featured players will be posted closer to the summer release date.